There are a number of things you can do to prevent a crash, and protect your brain if a crash occurs. Before riding, remember to follow the following tips from the National Highway Traffic Safety Administration. A printable version is available here. Position the helmet on your head so there is 1 inch (or two-fingers width) between your eyebrows and the front edge of the helmet. When you move the helmet from side to side and front to back, the helmet should be snug enough that the motion wrinkles the skin at your temples. Make sure you are fitting your helmet wearing the same hairstyle you ride with. A ponytail can change the way your helmet fits. With the chin strap buckled, test that it is tight enough by opening your mouth halfway — the helmet should press down on the top of your head. The side straps should meet just below and forward of your ear, forming a V.
Try to pull the back tip to the front up over the top of your head — if the front of your helmet moves down, the back straps need to be shortened. 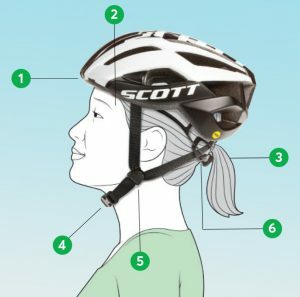 For more on how to properly fit your helmet, see this video from the League of American Bicyclists. While bicycles are allowed on roadways, riders may feel safer being separated from traffic. A lane or path is a safer choice than riding on a sidewalk. Riding on sidewalks puts you in a place where cars do not look for or expect to see moving traffic. Sidewalk riding puts you at risk for crashes at driveways and intersections and its illegal in many jurisdictions. Use bike lanes or bike paths, if and where available.